Karina, my mom is the one person who will ever love me more than anyone else in this world. This is probably true of most mothers and their children, but I know it’s true with mine. She’s loved me through changing my stinky diapers, to singing Twinkle, Twinkle Little Star in kindergarten… Through having my first crush (Mark Cathcart), to the full blown bad attitude of teenage girls… Through getting my first job, to dating my first real boyfriend… Through marrying Luke, to having three children. She’s been loving me through it all. I think this change has been the hardest on her. She’s supportive of our decision to enjoy our family’s wanderlust, but I know she desperately wants us nearby, always. My mom’s circle is very small and very well curated… There are very few people she fully trusts and allows into her heart, and to have five of us absent from everyday life leaves quite a hole. I will miss my mom because she loves me, Luke and the kids with her whole heart. Birthe (just call her Bea), my nanny invested so much time and love into me when I was a child. Many of my fondest memories involve my nanny and grandpa. My mom took my brother and I to my nanny and grandpa’s house almost every weekend when I was a kid. We would go to the beach and feed the geese. We would walk to the flea market to browse around and buy warm beer nuts. We would spend hours at the recreation centre (we called it the ‘Rex Complex’) watching people exercise, swim and play squash–sometimes we would even get to go swimming. We would hang out at the play centre in the mall and eat freshly made icing sugared donuts. We would frolic in their backyard, running through the sprinkler and enjoy barbecued meals, including my favourite potatoes in the whole world. I would always ask to sleep over, and my grandpa would always say yes. I slept in their room, right next to my nanny in my little sleeping nook on the floor, I would browse Danish magazines and “read” before bed just like her. We would wake up in the morning and eat soft boiled eggs for breakfast. We would make boats out of walnut shells, she would let us lick the beaters after whipping cream, we would play endless games of 31, War and Rummikub. No one knows this, but the first time I was ever moved to tears by a gesture someone made, was because of my nanny… Whenever we went to visit, we would almost always ask to go to the beach and feed the geese. On this day, I ran inside to ask nanny if we could go to the beach and the first thing I saw was my nanny standing at the counter, cutting bread for the birds, in anticipation of my desires for the day. Tears. I mattered and I was loved. To this day, I still feed birds because of her. Even the annoying seagulls. She knew how to connect to my heart like no one else–just as my mom knows how to connect to Isla, Jenson and Lincoln’s. I will miss my nanny because of her unconditional love, the kind that only a grandparent can provide… The kind that my grandpa also poured over me, who I’ve been missing since his passing in 2013. So much of who I am, I can proudly attribute to them. Stephen, my brother is probably one of the sweetest men I know. He’s been shaped by hard relationships all through his life. I pray for God to protect his heart every night. He was six years younger than me. I always loved to torture him, by making him watch horror movies with me, or telling scary stories, or by getting him to play 52 Pick Up, or by playing hide and seek with him and ‘forgetting’ to find him. Fortunately, he’s forgiven me for all of it. Now we bond over music we both like and silly videos he loves to share. He’s always so thoughtful that he’ll mentally keep a list of videos to share with me the next time we see each other. We laugh together and make fun of the oddball animals. He loves his niece and nephews and they love him right back. Almost all of their stories are of Uncle Stephen after they’ve visited their house. He chases them and tickles them and makes them laugh. I will miss Stephen because of his sweet and thoughtful heart in which I’m proud to hold a spot. 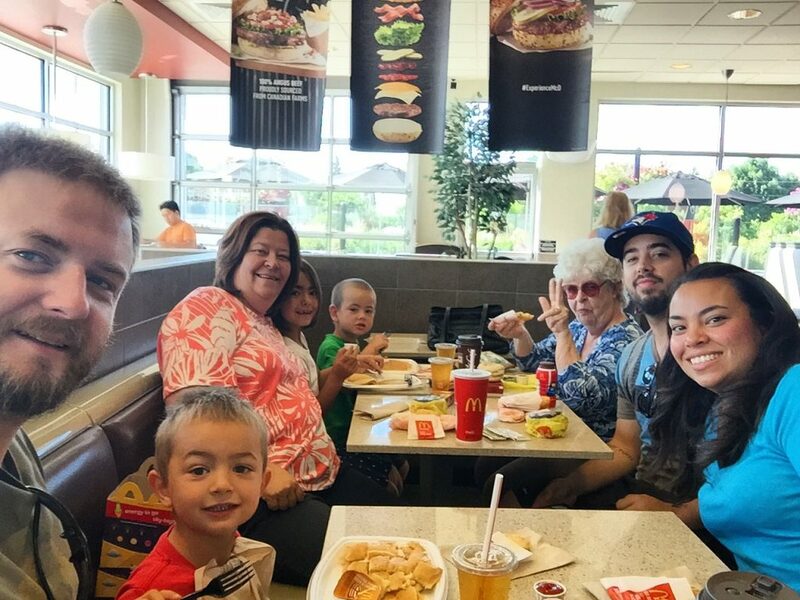 Luke, Lincoln, Karina, Isla, Jenson, Birthe, Stephen and me, enjoying our last family breakfast together at McDonald’s. Cin: You are so right and you made all of us tear up. But what beautiful words. Thank you from the bottom of my heart.